Is the Canon Rebel XTi Really Noisier than the XT? I've been a big fan of the Canon Rebel XT (350D) and carry it in my backpack as my point and shoot. Recently I got my hands on the Rebel XTi (400D) and have been enjoying the larger 2.5" LCD, improved user interface, automatic dust sensor cleaning, the cute little green power-on light, and of course the 10.2 megapixel sensor. This camera handles all of my Canon lenses, shoots RAW, and is quite responsive. 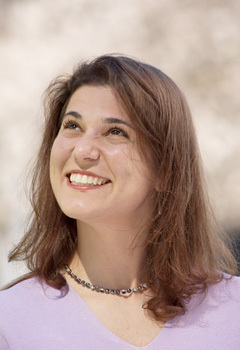 My research led to me an interesting report published on Camera Labs. If you're interested in this sort of thing, you should read it. They did a great job of comparing noise levels between the Canon Rebel XT, XTi, Nikon D200, and Sony Alpha. Their remarks? "In terms of its 10 Megapixel rivals, the EOS 400D / Rebel XTi delivers essentially the same results as the more expensive Nikon D200 at 200 ISO and above, while arguably enjoying a smoother image at 100 ISO. Interestingly, the Sony Alpha A100 exhibits noticeably higher noise than any of the other models here, especially at 800 ISO and above. The bottom line is Canon may have increased the resolution of the 400D / XTi, but its noise levels remain very low and usable even up to 1600 ISO." As you continue through the report, they could find some small differences at ISO 1600 between the XT and XTi. But they don't seem like an issue in real life shooting, and they certainly don't offset the other advantages provided by the XTi. My bottom line... the Canon Rebel XTi is my new point and shoot camera. And I really like the shots it produces. Looking for a sports lens but don't want to spend the $500+ from the name brands? Virtual camera club member Tom Bridge dropped me a note about the $150 Quantaray - 70-300 mm DI f/4-5.6 D for his Canon 10D. 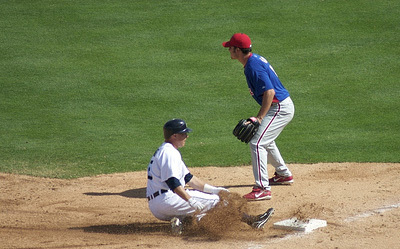 Tom took the lens out to the ballpark and captured some great shots from about 20 rows into the bleachers. Tom said this isn't an image stabilized lens, but it is quite sharp based on his testing. The focusing isn't as fast as a Canon USM zoom, but he was impressed with how quiet the Quantaray was during operation. With Spring in the air and baseball beckoning to aspiring sports photographers, I thought I'd pass along this tip from a reader. 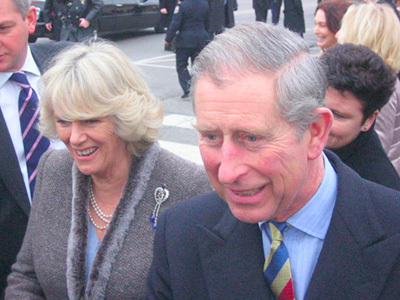 Aspiring photographer Brian Larrabee learned that Prince Charles and Camilla were to visit Philadelphia last January. Using his mom's Canon point and shoot, he was able to record a series of great images of the royal couple, including the shot I've featured here. Brian and his mom were so pleased with the images, they thought that someone might be interested in publishing them. They shared a sample gallery with a prospect and were asked to send a high resolution version. The only problem was, there were no high rez photos. The camera had been set to its lowest resolution in order to save memory on its card. Brian's priceless images were only 480 x 360. I asked if I could share this story because it's a good reminder to always shoot at your camera's highest resolution, and help others do the same. You never know when you're going to take that next great shot, and if you capture it, you want it as big as possible. Flash cards have become quite affordable, and if you find yourself running out of space, don't reduce the resolution, buy more memory. And congratulations to Brian for getting such great shots -- no matter the size, they are memorable photos. I'm working on my next Things I Learned the Hard Way podcast, if you have a good story to share, please send it along. Contact information is on our Submissions page. My friend Ben Long and I decided to take on an impossible self-assignment the other day: Could we take a decent portrait out in the bright Spring sunshine? I grabbed my camera and the Photoflex 5-in-1 MultiDisc 32"Reflector, then picked up a friend along the way who agreed to be our subject. The Photoflex kit, which sells for about $100, includes a translucent main disc that we call "the portable cloud," and a slip-on, reversible cover that has four different reflective surfaces. I also carry a second 22-inch disc to use as fill light when I'm using the larger disc as the portable cloud. I also highly recommend the LiteDisc Holder that makes it easier to position the disc or mount it to a light stand. We had lots of fun using the different combinations out in the bright sun. 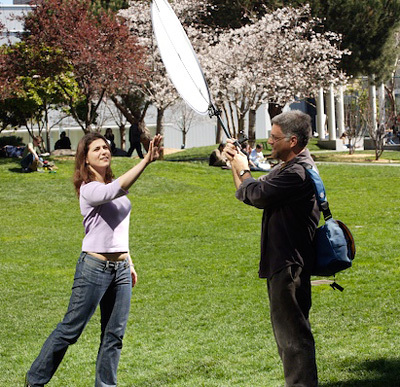 The Photoflex reflectors and Mother Nature's illumination allows me to create a photo studio just about anywhere -- I just have to make sure I have a second set of hands to hold the disc. With this image, we used the translucent disc above to soften the harsh midday sun, then added a fill reflector to illuminate the face. I recorded the image with a Canon 5D at 300mm wide open at f-5.6. One other benefit of the Photodisc is that it helps offset the green cast from the intensely vibrant grass lawn. And if you don't feel like springing the 100 bucks for the kit, you can use the windshield reflector for your car in a pinch. The Sigma DP1 looks like a stylish compact, but inside it uses the same 14 megapixel FOVEON X3 direct image sensor (2652×1768×3 layers) contained in the Sigma SD14 digital SLR. Coupled with a 16.6mm F4 lens for a wide angle field of view equivalent to 28mm on a 35mm film camera, and RAW mode, the DP1 packs a lot of capture quality in a small package. It's been interesting to watch this camera evolve, even though it still hasn't been released (we're guessing May of this year). The above picture is the prototype that Sigma displayed last September. The look of the camera has changed quite a bit since then with the addition of a hot shoe, mode dial on top, and more classic rangefinder styling. Here's what Sigma was showing off at PMA. I think the DP1 will be of particular interest to serious photographers committed to another DSLR system such as Canon or Nikon, but who want to work with the FOVEON three layer sensor. The DP1 should be perfect for landscape, street shooting, and working in crowded interiors. I suspect noise levels will be low at high ISOs, plus you have RAW for even more control in post production. No price has been set yet for the Sigma DP1, but I'm guessing that it will run around $799 US. We'll know for sure when it's released later this spring. 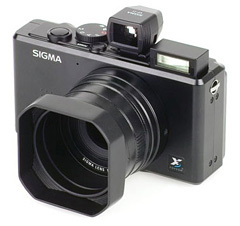 Top photo represents the first prototype that Sigma released in Sept. 2006. The middle photo is what Sigma was showing at PMA. The DP1 has changed considerably since its initial press release. The Panasonic DMC-FZ8 is a compact digital camera that features a 7.2 MP sensor, 12X Leica DC lens, image stabilization, 16:9 option, movie mode, and yes, Raw. The camera, due to ship anytime now, also includes a nice lens hood and filter adapter. I spent Friday morning shooting with DMC-FZ8 in the Red Rock wilderness area playing with the 36-432mm lens in Jpeg, Raw, and Movie mode. 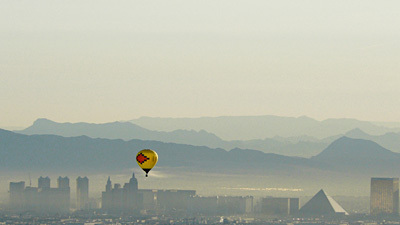 This shot of the balloon rising over the Las Vegas strip was captured in Jpeg mode, ISO 100, 1/500 @ f-7.1, 16:9, focal length at 55mm (330mm equivalent), image stabilization on, pattern meter mode resulting in a 3072x1728 image. Picture quality -- thanks to the lens and processor -- was excellent at ISO 100 and 200, good at 400, and acceptable at ISO 800. The movie mode was also excellent, capturing directly in QuickTime format with stereo sound. I really like shooting in 16:9 format for the movies, giving me a cinematic 848x480 viewing frame. Raw mode also worked well and is a welcome addition to this feature-rich camera. I had to use the latest version of Photoshop CS3 or the software included with the FZ8 to decode the files. But I imagine we'll see this capability added to Adobe Lightroom and other decoders before long. Overall, this is a very impressive camera that will sell for $349 or less. You have lots of pro features, such as manual exposure, aperture priority, manual focus mode, spot metering, 12X optics, Raw capture, filter adapter, and more. Performance was snappy and responsive. The right handle grip makes it easy to steady the camera while shooting, yet is is compact enough to slip into your jacket pocket or day pack. 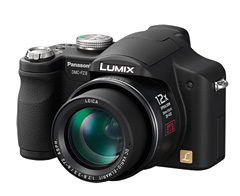 If you're looking for a high quality compact camera with Raw and a long zoom, the Panasonic FZ8 should be on your list. 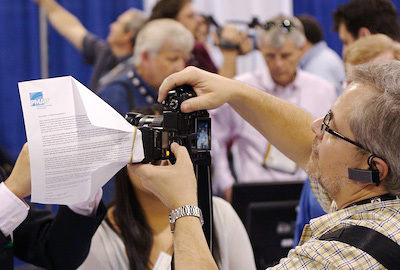 I saw tons of cool equipment at Wednesday's PMA Sneak Peek event, but my favorite was a sheet of letter-size paper folded and attached to a flash with a rubber band to create a very effective diffuser. I noticed that Steve Makris, a technology writer for the Edmonton Journal, using the device pictured above. I thought is was so simple, yet elegant and quite useful. If you look closely, he's actually using a PMA memo. And the best thing about it... "I get a fresh one every day," says Steve. All the more reason to make sure you have a handful of rubber bands in your camera bag. I'm off to Las Vegas to cover this year's PMA show. If you've been following the industry news, you know that already lots of pre-show announcements have been released, such as the Nikon D40x. But there will be more, and I will be there in person to figure it out and relay the information to you. I have meetings set up with Adobe, Nikon, HP, Pentax, Panasonic, and more. I'll do my best to get you the inside scoop, and hopefully an interview for our weekly podcasts. And if there's anything interesting on the show floor, I'll send along a snapshot or two. If you create slideshows with your photos and burn them to DVD for playback in set-top players, you might want to enhance your packaging with a nice album cover and liner notes. You can make these easily using iTunes. Just create a new playlist, add a QuickTime version of your slideshow to the playlist, then enter the title and author data by using the Get Info (File > Get Info). Now all you have to do is select the playlist and choose Print (File > Print). 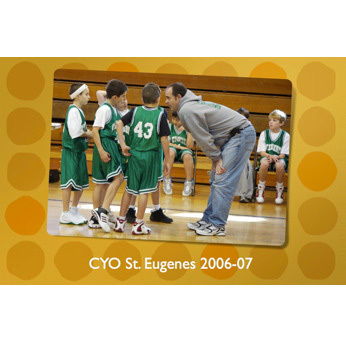 You have a handful of themes to choose from, pick the one you like, click Print, and out of your printer pops a beautiful DVD insert. It's that easy. Apple's Preview application is a terrific all-purpose imaging program that comes loaded free on every Mac. It's perfect for reading PDFs, but I've talked before about its many photographer-friendly features, such as in The Simplest of All Raw Converters. I have more of these tricks up my sleeve, and one that I want to show you today is how to use this application as a quick previewer of how an image will print on various ink/paper stock combinations. All you have to do is drag your photo onto Preview to open it, go to Tools > Assign Profile, and pick the printer/paper combination you want to preview (obviously you will have to have ICC profiles loaded on your Mac). You can toggle back and forth between the original shot and the adjusted profile shot using the CMD-Z / SHIFT CMD-Z keystroke combinations. Keep in mind that your monitor has to be calibrated in order for this exercise to be valuable. But it's a great way to take a quick look at how an image should print (more or less) with a certain printer and paper, even if you're not hooked up to that printer at the time.